Is it Loss, or Gain? Sometimes when life changes are difficult, it is these times, when we need to look through “our eyes” as “through the eyes of a child.” Through these eyes, we see all that is beautiful and innocence in our world. We are “living in the moment.” This is how we, as spirit, must train ourselves to “live in the moment,” not the future or past; but NOW. If you find yourself “thinking” about the past, once again, say; STOP IT! You’ll find it quite effective; it did wonders for me! Most people give gratitude for the bigger things in life. It is through gratitude of the small things that make us strong. Sometimes life’s hard lessons, can be smoothed over, by something as small as walking through your grass, and stumbling across the tiniest of flower, and giving thanks to it for “gracing” YOU with its presence. This is where grace comes from; gratitude. EVERYTHING is “alive” and love; including plants. Many will pop up just to make your day pleasant; others are placed there by angels, to make you smile, while you are in the midst of despair. Last November, here in Western NY, I had a single Gerber daisy, pop up out of our dead grass, next to our driveway. I spotted it on the way to get the mail, at our mailbox; out by the road. Out loud, I thanked it for gracing my day. I told it, “I hope you don’t mind if I pick you and put you in my studio? 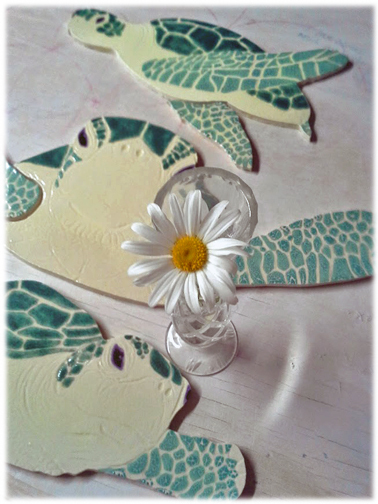 I want to be able to see you every day!” That little daisy lasted 2 weeks in the heat of my ceramic studio. 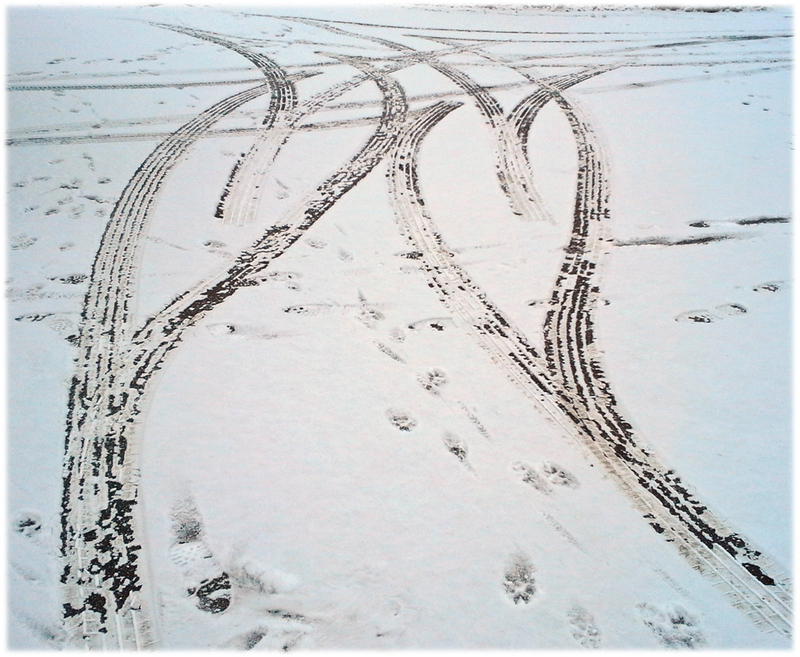 Then, there are the heart-shaped, van tracks my boyfriend, Chris, unintentionally makes in the Winter’s snow. How beautiful is that? If we just look, we will truly see blessings in the smallest of places; in the oddest of spaces. I used to have some time to take walks in our woods. There, I would find small milk glass bottles from old, cabin’s, from days-gone-by. They were buried in old garbage piles. Occasionally, one would pop up through the soil and I would dig them out. After my Mom passed in 2012, I was returning in my car, from an errand that I was running. As I pulled around the corner of my street and was approaching the edge of our lawn; where it meets the woods, I spotted a stick that was stuck in the ground. What a beautiful sight to behold; it had an old Pond’s milk glass bottle on it. I thought, “Who knows that I collect those bottles?” The answer was NOBODY; or should I say, “NO BODY.” This bottle was left for me, to brighten my day, by someone in spirit that watches over me. Yes, they ALWAYS watch over us; even without their “body suits” on. My husband Roger crossed-over, when I was only 50 years old; leaving me a young widow, with a new career, and two elderly parents to care for at home. Some of you that are “more advanced” on your spiritual paths, and have lost loved ones, will KNOW yourself that what I’m about to say, is divine. Pardon my candor, but my husband, Roger is far more of value to me on “the other side.” This doesn’t mean that I didn’t love him more than anyone on earth; it simply means that he sacrificed himself; “in the body” for me, and I know this for a fact. I like to tell people that I NEVER feel alone; it’s impossible for many reasons. First, we can’t hide from Father; he is right inside us, through all of our trials and joys. Our loved ones are also ALWAYS around us. Just one thought or prayer, and they drop everything for us. I have several hanging over my shoulder at this very moment saying, “Go Diane!” spread the word about love. Expand your frequency with “uplifting” words; tell the masses! I don’t know about all of you, but I find it’s the things that I have to work hard for that are the most rewarding. Things that are easily achieved, just don’t seem to hold their value.